PHILADELPHIA (AP) The Philadelphia Phillies went outside the organization and perhaps outside the box to get a new manager. 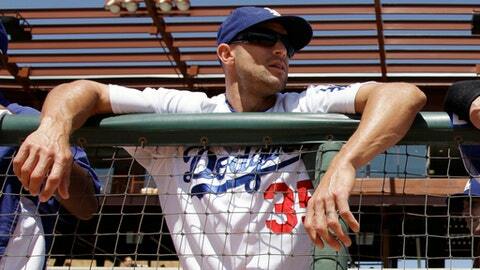 Former major league outfielder Gabe Kapler was hired Monday, completing a search that lasted one month. Kapler has served as director of player development for the Los Angeles Dodgers since 2014. The Dodgers trail the Houston Astros 3-2 in the World Series. Game 6 is Tuesday night in Los Angeles. Kapler will be introduced at a news conference after the Series ends. The 42-year-old Kapler replaces Pete Mackanin, who moved into a front-office position. Kapler batted .268 with 82 homers and 386 RBIs over 12 seasons with six teams between 1998-2010. He had no previous ties to the Phillies. ”Gabe has a track record of leadership, winning, progressive thinking and working with young players, and we fully believe that he is the right person to guide this organization into the future,” general manager Matt Klentak said. That ”progressive” thinking includes a fondness for analytics and sports science. Those are two important areas for Philadelphia’s management group. Klentak said he wanted a manager with a new voice and style to lead the Phillies into contention. They finished 66-96, but a talented core of young players improved in the second half and could be ready to compete. Kapler’s only managerial experience came in 2007 when he took a season off from playing to lead Boston’s Single-A affiliate. He also coached Team Israel during the 2013 World Baseball Classic qualifying period. ”I’m obviously very excited for Gabe, and I think he’ll do a great job with that young group of players, a very talented group,” Dodgers manager Dave Roberts said. ”But as far as with respect to our farm system and the culture that he’s kind of instilled with the teaching, he’s really impacted the guys that are with us right now.